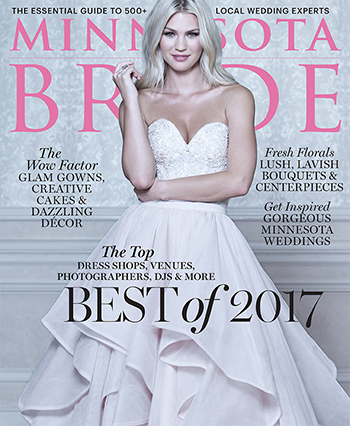 Best of 2017: The top photographers, venues, dress shops, DJs and more! Luxe lace and superfine silks—for wedding lingerie, less is so much more. Sleek, structured silhouettes and delightfully modern details take the lead on this season’s ultracool wedding looks. Minneapolis’ historic 300 Clifton bed and breakfast, tucked away in the Loring Park neighborhood, pairs new amenities with old-school charm. Curley mixed this subtle shade with rose gold and marble to create a fresh, refined feel, for elevated sophistication. Thanks to their brand-new cart—designed by local woodworkers WAAM Industries—husband-and-wife team Kou and Christi Kue can roll up to your event and make mouthwatering sushi rolls to order. Snapchat filters are the new must-have wedding accessory. The ballroom holds 200 guests and is fully customizable, which means you can create the indoor/outdoor rustic wedding of your dreams, or a super-sleek modern affair. The St. Paul-based gourmet popcorn company, which uses mostly local ingredients to create its 11 seasonally rotating flavors, is a fun choice for reception popcorn bars or favor bags. Yes, this is the industrial-style home of favorite local makers Red Table Meat Co. and Baker’s Field Flour & Bread—but it’s also a cool event space. Wedding food gets a lot of attention, but let’s not forget about that real reception hero—the cocktail. There are many noteworthy things about Shindig, but the top of that list just might be the top of the building itself—the rooftop. Indulge your flair for the dramatic with a stylish black-accented cake. With tasty cakes to sample, sparkling wines to sip and gorgeous bouquets to choose, transportation can often take the back seat in the wedding planning process. Rich in history, these Twin Cities clubs—social, recreational and athletic—have been the haunts of the powerful and glamorous, and inspire stories of their own. Though many consider winter to be the wedding off-season, more brides are choosing to say “I do” in the colder months. A white tent and cascading flower arrangements transformed the tennis court into a heavenly setting for dinner and dancing. Calhoun Beach Club’s white-on-white décor was festooned with stunning arrangements of garden roses, hydrangea and trailing vines. When rain clouds appeared, the bride’s cousin rounded up a bunch of whimsical transparent umbrellas for the wedding party. The menu included local cheeses, bacon flights and Korean beef sliders, plus signature cocktails and plenty of Day Block beers. Gemstones and geodes were a natural point of inspiration—polished, geometric and with a striking jewel-toned color palette. The wedding’s peach and gold color palette was strongly influenced by Julie’s profession as a makeup artist—she wanted colors that would complement a bold red lip. For the look of their wedding, Heather drew inspiration from their custom rose-gold wedding rings. Michelle’s dad made custom bean bag-toss sets and a life-size Jenga that doubled as a guestbook. Amy chose an assortment of 20 mini cakes in a variety of delicious flavors, and her mom curated the perfect assortment of chocolate and candy for the favor boxes. After the ceremony, they drove his father’s yellow 1966 Mustang to Central Park in Northfield, one of their favorite spots during their high school dates. The soaring ceiling and exposed beams of Bloom Lake Barn offered an elegant but unfussy setting, but the couple was most wowed by the natural beauty of the ceremony site and rustic charm of the barn. Instead of a unity candle, the couple planted a tree with soil from their respective childhood homes; continuing the natural theme, guests took home seedlings to plant as favors.